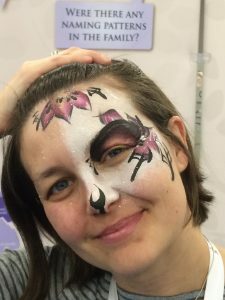 The Passionate Genealogist | By Ruth Blair – Family History is my passion and my goal is to help others find and share that same passion. And we have a winner! 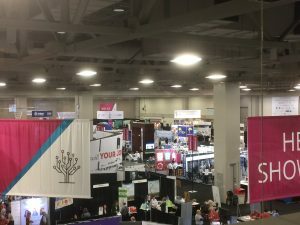 RootsTech Pass Giveaway! Congratulations to Rita McClellan! 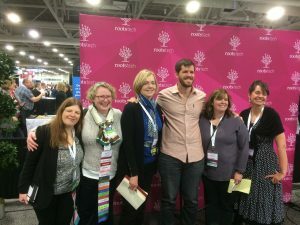 She has won my RootsTech Pass Giveway! I am looking forward to meeting her in Salt Lake City next year! 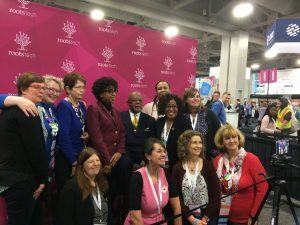 As a RootsTech Ambassador I am fortunate to be able to give away one complimentary RootsTech 2019 4-day pass valued at $299 US to one of my followers. This does not include hotel, flight, meals or any extras such as paid lunches or labs. 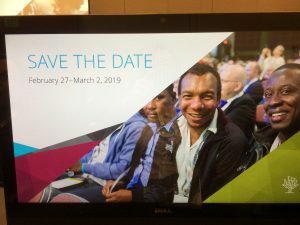 You can find out more about RootsTech on their website. How do you enter? 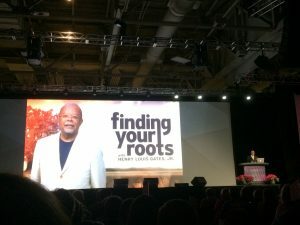 Leave a comment on this post and tell me why you really want to go to RootsTech 2019 then tell me the one thing you really want to do while at RootsTech. The contest will close on 08 November 2018 so add your comment to this post now! Saturday started early with the MyHeritage Friends Breakfast. It was a chance to catch up with some friends I hadn’t had a chance to connect with yet. 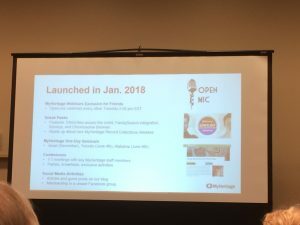 MyHeritage were promoting the new advancements in their DNA database as well as their historical records database. Today’s Keynote Speaker was Henry Louis Gates Jr. and everyone was excited to hear him speak. 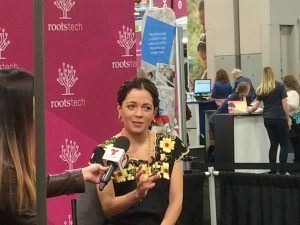 The other Keynote Speaker was Natalia LaFourcade who sang the song Remember Me in Coco and was performing it at the Oscars the next night. 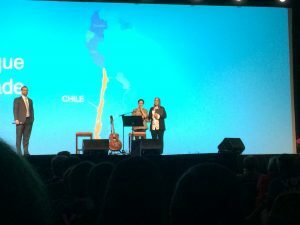 Natalia LaFourcade started the Keynote talking about here family history and the song Remember Me. She performed several songs and when her session was finished FamilySearch presented her with a copy of her family history. More tears. These are always very touching moments particularly when they can prove some of the family legends of the Keynote. You can hear their Keynotes and view the live streamed sessions here. Henry Louis Gates Jr. was a more traditional kind of keynote. 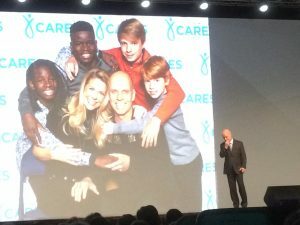 He talked about his family history research, his PBS programs and a new initiative to get children involved in exploring their family history with DNA and research. He has started a summer camp for children to help them learn and explore their personal history. It is called The Seedlings and you can learn more here. I didn’t get a chance to interview Natalia LaFourcade but I did get to ask Henry Louis Gates Jr a question. I asked if he considered doing a show about the family histories of African American families who ended up in Canada via the Underground Railroad. He seemed interested in the idea. The stories could be an exciting journey. 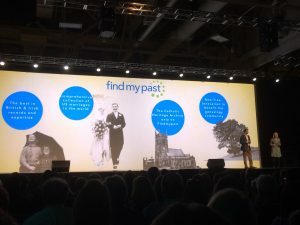 Ancestry was the featured sponsor during Saturday’s Keynote. 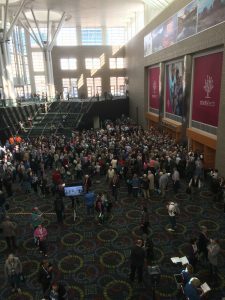 Saturday is also Family Discovery Day at RootsTech so there are lots of children in attendance. It is nice to see the next generation getting involved in family history. They bring a new perspective. It is always a very busy day and I spent most of the day revisiting exhibitors that I wanted to learn more about. 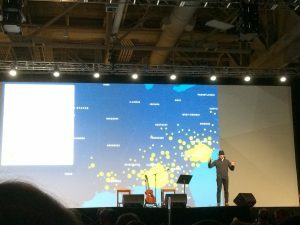 Coco was a big theme of this Family Discovery Day event at RootsTech. Face painting was all the rage and even those who are a kid at heart got in the act. Some of the kids were wearing balloon hats. It was just a good time all around. I took another Lab on Saturday. It was about the company called Forever. They provide online storage for your photographs and you can create books and other items through the website. Since I have a dining table filled with photographs this type of thing was on my mind. We had to download the app to our phone or iPad and I had it on my iPad. It was very easy to operate and afterwards I went and took advantage of the RootsTech special price for their storage packages. I am still getting the photographs organized and just about ready to start scanning and once that happens I have a place I can store my photos and create items to give as presents. Labs are a great class to take. They cost an extra fee of about $20 but they are small and usually give you hands-on experience with the topic you are learning about. I find this very useful especially when there are people there to help answer your questions. I took my first lab last year and will take more next year. By the end of the day I was wandering all around the Expo Hall to say goodbye to my friends and new acquaintances. I wanted to make sure I caught up with everyone. Then it was an early night as I had to be at the airport early the next morning. Not to mention the snow storm that came overnight. There was a slight delay leaving but by the time we left it was sunny and blue sky. We just had to wait for de-icing and snow plowing. While wandering around the airport I ran into other Genies who were on their way home so there was time for more chat. 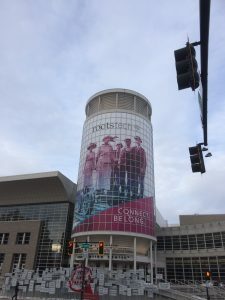 I am so looking forward to next year’s RootsTech. It has become a must do event on my genealogy calendar. Friday was another early start and the Keynote Speaker was Scott Hamilton the Olympic Medalist Figure Skater. His story was so inspiring and heartfelt. He was adopted and hadn’t looked into his own eyes until he saw his new born son for the first time. This was someone from his blood and connected to him. He has the place in tears. I got the opportunity to interview him at the Media Hub and asked him when you are competing do you get friendly with the other competitors and I particularly asked about Brian Orser and Kurt Browning who were Canadian Olympic figure skaters at the same time he was. He said he is still in touch with them and that Brian was going to visit him and help him with some coaching. It is nice to think that they stay in touch. You can watch his Keynote and the live streamed sessions here. This Keynote was sponsored by Findmypast who gave us an update on their website and introduced us to their new CEO Tamsin Todd. Findmypast is the largest database of English and Irish records. Today I got to attend one session called Organizing Genealogy Research Using Archival Ideas and it was a very interesting session. She gave us a link to a free ebook download that was only good for Friday. I had my iPad with me and thought I had downloaded it but it didn’t take so when I got home on Sunday I couldn’t access the ebook anymore. It would have been nice if she had provided a link for the attendees to use when they got home. Or a coupon code that attendees could use to download it for free anytime. The lab today was Story Telling for Posterity with Podcasting. I was a little disappointed because I thought we might get more hands on experience and more details about the equipment required to do podcasting. Still I did learn some new things and that is always a good thing. The other session I attended was Video Stories: Free, Easy and Awesome New Video Tools You’ll Love. This isn’t something I have done before and it sounded like a great idea. The lecture was fun and informative. Something to add to my to-do-list! Friday night the Expo Hall was open until 7 pm and after that I went to dinner with some friends and then on to the MyHeritage After Party which had a 1920s theme this year. We got there a little late but the band was terrific and there were people there teaching you some dance moves to the music. 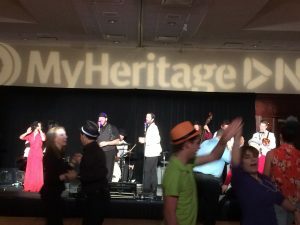 The MyHeritage After Party is always good fun. 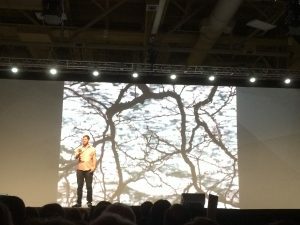 We are now nearing the end of RootsTech. One more day to go. Thursday was an early start as it was the first of the Keynotes. Today’s speaker was Brandon Stanton. In case you don’t know who he is he is the photographer/blogger who started Humans of New York. He was a very inspirational speaker and told us how he got started and how nervous he was about taking his first picture as part of his project. He sold a picture to a friend to get money to move to New York and gave up his job in finance. He is now living his passion. I got the opportunity to interview him back at the Media Hub and asked him if he had any connection to the sites that have popped up similar to Humans of New York. There are others like Humans of Toronto and Humans of Dublin. He said he didn’t and wasn’t happy with some that seemed to be doing it for different reasons. You can watch his Keynote and other live streaming sessions here. 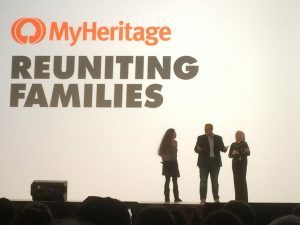 Thursday’s Keynote was sponsored by MyHeritage so we got updates on what they were doing and how their site was expanding. 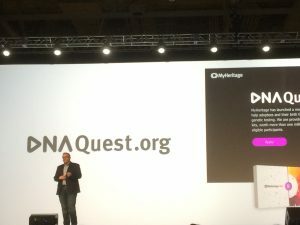 They have started a program called DNAQuest to give free DNA Kits to adoptees searching for their birth families. 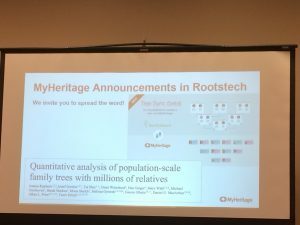 Since RootsTech has ended they have come out with lots of new improvements to their DNA site. Once I had finished my interview with Brandon Stanton I went to see about some sessions. Again the lines ups were long and I decided to wander the Expo Hall and learn more about some of the new vendors. My discoveries will be found in a separate blog post. I had one lab today and it was Story Telling for Posterity with Podcasting. This was one I was really looking forward to attending as podcasting is something I have been thinking about venturing into. Unfortunately the speaker didn’t show up because of a communication mix up. 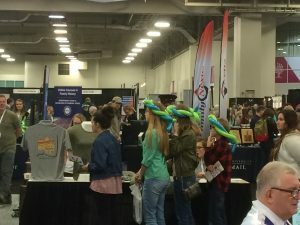 The RootsTech people were very apologetic and told us to go to Customer Service to either get a refund or sign up for the same lab being offered on Friday. The people at Customer Service were fantastic and had already heard about the problem by the time I got there. Since this was one I was very interested in I decided to sign up for the Friday offering. 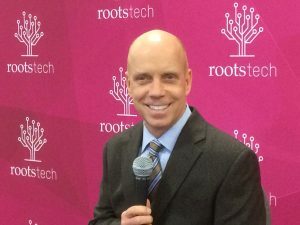 Kudos to the RootsTech staff for their handling of this situation. They did a fantastic job. Thursday evening I went out with some friends and had the opportunity for some catch up time with them.